When Canada announced their 23-person women’s hockey roster for the 2018 PyeongChang Olympic Winter Games, they forgot to mention one key player — confidence. Canada is seemingly brimming with it after getting the upper hand in an exhibition series sprawled out over three months against the U.S., the number one ranked team in the world. A series in which Canada won five of the six outings. “I think it brings, definitely, a lot of confidence,” said veteran forward Meghan Agosta (Ruthven, Ont./Hockey Canada). After a tough couple of years since Canada won their fourth Olympic gold medal in a row, the swagger is not smug or presumptuous. Rather, it’s a realization that, despite dropping four world championships in a row and being three-time losers at the 4 Nations Cup, the national team just south of the border isn’t unbreakable. “At the end of the day, we are going into the Olympics and it’s not about what we have done in the past, but using that as momentum to continue on and take each day at a time and each team at a time. We can’t take any team for granted. We need to concentrate on the opponent we are facing and if it ends up we are playing the U.S. in the finals, that just means we need to go out and play our game and believe in ourselves and our abilities and know that they can be beat,” said Agosta. Defenceman Meaghan Mikkelson (St. Albert. Alta/Calgary, CWHL) said the team had to move away from concentrating on what the U.S. team was doing and put the focus back on themselves. A process that proved successful as they moved through the exhibition series. Canada will take 14 forwards with them to the Olympics, eight of them returning from the 2014 Games. For veteran forward Brianne Jenner (Oakville, Ont./Calgary, CWHL), one word immediately pops in her head when it comes to the mix of new and returning players. And Coach Laura Schuler points to rookie Bailey Bram (Ste. Anne, Man./Calgary, CWHL) as one of those players. 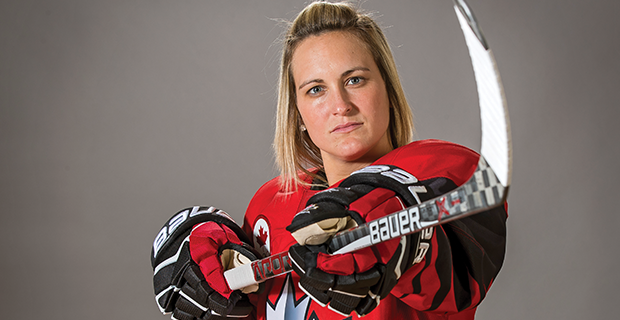 Also making their first trip to the Olympics will be Emily Clark (Saskatoon, Sask./University of Wisconsin, WCHA), Jillian Saulnier (Halifax, N.S./Calgary, CWHL), Sarah Nurse (Hamilton, Ont./University of Wisconsin, WCHA) and Blayre Turnbull (Stellarton, N.S./Calgary, CWHL). Canada’s golden goal scorer, Marie-Philip Poulin will lead the national women’s hockey team at the PyeongChang 2018 Olympic Winter Games. Poulin, who scored the game-winning goal in both the gold medal finals at the 2010 and 2014 Olympics, has captained the national team since the 2015 IIHF Women’s World Championship. She has captained the team through several international tournaments since the last Olympics as the torch was passed to her from Caroline Ouellette, who retired from international play along with Gillian Apps, Jayne Hefford and Hayley Wickenheiser. “Just having that group of veterans that have been around the past couple of years is quite awesome. I think we have built as a team and having the young faces coming up is quite exciting … for us as veterans now, we take that role very seriously. I have been so lucky throughout the past couple of years of having great role models. We all looked up to them and having those shoes to fill is quite the honour. We take pride in that,” said Poulin. The golden goal scorer at the past two Olympics, Poulin has notched eight goals and 12 points in her 10-game Olympic career. She along with teammates Rebecca Johnston (Sudbury, Ont./Calgary, CWHL) and Wickenheiser led the team in scoring at the 2014 Games with five points apiece. In the recent exhibition series against the U.S., Poulin and Agosta led the team with five points each. Among the returning players are Agosta, Mélodie Daoust (Valleyfield, Que./McGill University), Haley Irwin (Thunder Bay, Ont./Calgary, CWHL), Jenner, Johnston, Poulin, Natalie Spooner (Scarborough, Ont./Toronto, CWHL) and Jennifer Wakefield (Pickering, Ont./Linkoping, Sweden). Canada will have a slightly different look on defence as they head into PyeongChang. Tara Watchorn and Catherine Ward announced their retirement from the national program, giving space for Brigette Lacquette (Mallard, Man./Calgary, CWHL) and Renata Fast (Burlington, Ont./Toronto, CWHL). Centralization was a reunion for Lacquette and returnee Jocelyne Larocque (Ste. Anne, Man./CWHL). Also returning are Lauriane Rougeau (Beaconsfield, Que./Montreal, CWHL), Laura Fortino (Hamilton, Ont./CWHL) and Mikkelson. Expect Fortino and Larocque to continue to log big minutes for Canada at the Olympics. While Ward held down the most minutes at the last Games (121:14), Fortino was a close second with 113:39 minutes logged, followed by Larocque at 107:16. Shannon Szabados (Edmonton, Alta./Hockey Canada) has helped Canada win the past two Olympic gold medals and there is no reason to believe she won’t be called upon as the number one goalie in PyeongChang. Riding right next to her again will be Geneviève Lacasse (Kingston, Ont./Calgary, CWHL), who is a returnee to the national team for the Olympics (however she did not see any action in Sochi). Canada had to make extremely tough decisions when it came to choosing the three goalies they would take with them. With college standout and 2017 Patty Kazmaier winner Ann-Renée Desbiens (La Malbaie, Que./University of Wisconsin, WCHA) on the rise, she beat out a prominent contender for Canadian Olympic roster in Emerance Maschmeyer.